William Barr has a nose for spotting gaps in the literature of 19th-century Arctic exploration. He has already produced three volumes on lesser-known aspects of Franklin search expeditions, including translations of the journals of French and German participants as well as those of Anderson and Stewart’s 1855 journey via the Back River. Now he has fastened on an expedition that’s better-known—that of Richard Collinson in the Enterprise—but that has still escaped dedicated study. Indeed, no book devoted to the expedition has been published since Collinson’s own journal. 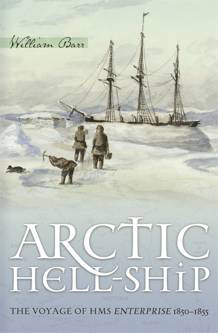 In the mid-19th century there was a ready market for accounts of almost any Arctic naval expedition while its return was still fresh in the public memory, so it is perhaps significant that even in such a favourable publishing climate neither John Murray nor any of his competitors brought out an account of this one. It was to be more than three decades later, and only after Collinson was safely dead, that his journal was published (in an edition prepared by his brother). One doesn’t have to go far for an explanation of this unusual state of affairs. The expedition had returned to Britain with all of its executive officers under arrest for various offences: Collinson wanted them all court-martialled, and they all wanted him court-martialled. A typical bureaucratic compromise was reached: no one was court-martialled, and everyone was promoted. To prevent the officers bringing private prosecutions to redress what they regarded as unwarranted slurs on their characters, the Admiralty had presumably given them private assurances that their arrest would not be considered when it came to seeking new assignments, so long as they kept quiet, for it is otherwise hard to explain the complete lack of any public statements by any parties to the dispute—so unlike the protracted and vicious campaign that John Barrow and John Ross had conducted against each other in print in the 1820s. Since any published journal of the expedition would not be credible if it did not allude to the disputes—the fact of which, if not the substance, had already filtered out to the press from the reports of other ships’ companies—it would clearly be simplest if there were no published journal at all. And in the wider political background, the Admiralty, already smarting from the loss of the four ships Belcher’s expedition had left behind and with a new and urgent focus of attention in the Crimea, would not have welcomed any additional adverse publicity. Combined with the fact that the expedition mapped only 40 kilometres of coastline for the first time, found no new information about Franklin, and was overshadowed by the exploits of its consort vessel, Investigator, whose crew (though not the ship) actually traversed the North-West Passage for the first time, and it is easy to see why no published journal was immediately forthcoming. Every star of fortune was against the Enterprise. Into this messy vacancy of material, then, in which the only previous contribution was Collinson’s own self-bowdlerized and clearly partial account, Barr has attempted to shine all the light that modern scholarship can bring to bear. For such a contentious voyage, the crucial task was to find accounts that provided other viewpoints than the captain’s, and this Barr has been able to do by tracking down the manuscript journal of one of the arrested officers, Second Master Francis Skead (which however ends at the point of his arrest, only a third of the way into the expedition) and the second half of the journal of one of the stewards, Richard Shingleton, which provides some supplementary material but avoids direct comment on the conflict between his superiors. Barr uses these, along with Collinson’s own journal and much other more minor material gathered from various archives, to string together a narrative of the five-year expedition, during most of which time it was completely out of contact with the outside world. The aim of the Enterprise and Investigator had been to attack the problem of Franklin’s disappearance from the west, thus linking up with the much more numerous search vessels working from the east. Between them, the theory went, the two contingents should cover all the likely ground, and maybe meet up with each other and complete the mapping of the passage. But the captain of the Investigator, Robert McClure, was everything his commanding officer Collinson was not—a bold gambler whose decisiveness gave him a whole year’s head start in the Arctic, while the cautious, even pusillanimous Collinson retreated to Hong Kong instead of wintering in the ice. This decision exasperated his officers, and the realization—if not acknowledgement—that his judgement was mistaken was probably behind his later supersensitivity to traces of disrespect in his lieutenants’ behaviour. One by one, he picked them off, starting with Skead, who was arrested for recalling casually after dinner one evening that the captain had been drunk when he returned from a banquet while they were in Hong Kong. Collinson’s correspondence book, an official Admiralty document that unlike his journal he could not censor, shows his sarcastic and inflexible attitude once his mind was made up, and that the charges were mostly based on hearsay against which the accused had had no opportunity to defend himself. George Phayre, the 1st Lieutenant, seemed to be something of a troublemaker who maliciously reported gossip, but a captain with real leadership qualities would not have given Phayre the encouragement to do so. Ironically, Phayre ultimately fell foul of his own tactic. His downfall, interestingly, came about because he had been insulted by ice master John Atkinson—a professional whaler brought along for his experience in navigating among ice floes. Quite apart from their non-naval backgrounds, such men were considered “crew”, not officers, and in normal circumstances it would have been inconceivable for a captain to take a crewman’s part against an officer—something regarded as deadly for discipline and morale. The unusual feature of Collinson’s behaviour, marking him out from more stereotypically tyrannical figures such as William Bligh, was that while he could play the martinet with his officers, he was solicitous of the views and welfare of his crew. Even so, when Phayre refused to accept Atkinson’s mealy-mouthed apology and told Collinson he could no longer work with the ice master, he cannot have been the only one to be amazed that the captain took Atkinson’s part and relieved Phayre, not Atkinson, of his duties. While all this was going on they were attempting to navigate some of the most difficult waters in the world, and in sailing through Dolphin and Union Strait, Coronation Gulf, and Dease Strait along the south coast of Victoria Island as far as Cambridge Bay, they went where no ship had been before. Years later Roald Amundsen, sailing through the same area in the much smaller Gjøa, took his hat off to Collinson for bringing a heavy, deep-draughted naval vessel through such shallow, reef-strewn, ice-choked seas—and not only that, but (unlike McClure) getting it back home again afterwards. This, more than the 40 kilometres of new coastline Collinson surveyed (everywhere else they went they found they had been preceded either by McClure or by Rae), is the solid exploratory achievement of the voyage, yet even here the story is less heroic than it sounds: their keel hit the bottom so many times they lost count, and there was sizeable luck as well as skill in avoiding a grounding they could not extricate themselves from. Then in what can only be described as a deeply cynical manoeuvre, Collinson put his last remaining officer, Lieutenant Jago, under arrest for unspecified charges as soon as he had rounded Cape Prince of Wales—and thus left the most difficult sailing conditions behind—on the homeward journey. Collinson never again put in for a command: he must have guessed what the answer would be. As in many of his former books, Barr has performed what could be described as a public service to Arctic scholars and interested readers alike in making available the fruits of his researches in often obscure and unpublished sources. But this approach has its problems. When I reviewed his edition of Peter Dease’s journal, I remarked that it was a pity that Barr—who had assembled and arranged the archival material with such care—had done so little work in actually assessing and commenting on it. What applied there applies a fortiori here, since Arctic Hell-Ship, though it includes extensive quotes, is not an edition of anyone’s journal, but Barr’s own book about the Enterprise expedition. That requires having some ideas and opinions about the material as well as simply presenting it, because readers have a right to expect something more than the authorial absence displayed here. Instead of vividly drawn portraits of the protagonists and dramatic descriptions of the events, what we find between the quotations is an unfortunately colourless and clunky recitation of proceedings, lacking stylistic verve or linguistic panache despite the striking interplay of physical danger and personal tension that must frequently have electrified the scenes he describes. In the final chapter, “Results and Reactions”, Barr is so concerned to tell us what previous writers have thought of Collinson that he forgets to have an opinion of his own, completing the sense of disengagement that has been an undercurrent throughout. It makes the reader wonder whether the author is actually interested in the events at all. Barr has assembled more material about the expedition than anyone before him, but sadly the work of turning it into an enjoyably readable book has yet to be done.